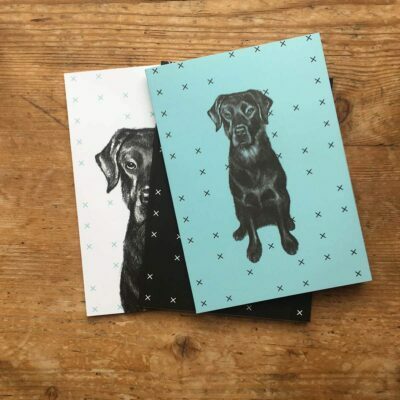 If you like our Black Labrador stationery then you’ll LOVE these criss cross pattern notepads! Now don’t get us wrong, we love our black lab notepads but we also loved the geometric pattern that we used in the design which is why we’ve dedicated this trio of notebooks to showcase a much-loved pattern of ours! There are 3 notepads in this set, one is printed black, the other a pale blue and the third one left white. Each one has printed on it a simple, randomised criss cross pattern. The notepads are A5 in size and each contains 64 unruled pages. The 3 are held together in a pretty belly band and packaged in a clear cello bag.